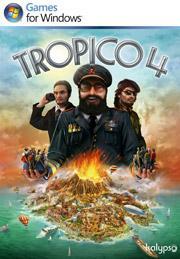 Tropico 4 is the sequel to Tropico 3 in the long line of successful Tropico games. Some argue the game is more of an expansion than a full game of it's own. So here is a fairly complete list of features that have been added since the last iteration. New Disasters (Tsunamis, Volcanoes, Tornadoes, Earthquakes and of course Hurricanes), along with this comes a weather station. The weather station can be built to help warn you of upcoming disasters. Certain upgrades help mitigate the damage of certain types of weather. Upon the destruction of a building it will leave a pile of rubble in which you can easily tell it to rebuild that building or clean it up. Quick Build is a great new feature. For an extra price you can almost instantly build a new building without and construction workers at all. Construction workers build faster in general in Tropico 4. The Ministry allows you to hire certain citizens or emigrate someone to work for you. Certain edicts now require a minister in a specific post. Occasionally a minister will do something good or bad. When they go off and do something dumb you have the option of firing them or keeping them, either one will have it's own consequences or perks. The new Stock Exchange building allows you to find foreign investors from different countries. At this building you will find offers to build a certain building and a yearly rent on a building. Sometimes you will find a deal in here that will provide more yearly income than building that building on your own would ever return. However if you island doesn't have the workers for it, or the supplies to run it, it can and will fail. Tropico now importing goods. Every dock has an amount of cash to spend on imports. You decide which types of resources need to be imported. Uranium for example must be imported from other countries for a nuclear power plant. You can go over to your furniture factory and tell it either to import or wood or not to. This allows you to build a jewelry factory for example without ever having a gold mine. Of course it is always more profitable to simple mine it yourself. The biggest bonus is that you can stop your people from starving if you do not have enough farms. Faction Missions - Completing missions from factions can earn you bonus points with certain factions. You will see various missions pop up throughout the city. Diplomacy - Along with the U.S. and U.S.S.R. you will also have diplomacy with Europe, the Middle East and China. Raising relations with any of these countries can be important to stability, trade prices and relations with the U.S. and Soviet Union. Island size and population is often larger than what is found in Tropico 3. Small graphic updates. Lighting is better. So what do we think of Tropico? It does feel kind of like an expansion, but it's a big one. The game is certainly more streamlined and more fun to play. You actually feel like you are diplomatically involved with your country and the world. The fast building makes it so much easier to build a small city on the completely opposite side of the island when you need to build that big oil refinery or a small tourist spot. The game is a 100% more fun to play. With the difficulty settings set low for more challenging gameplay, every option becomes very important and you actually can feel your country destabilizing. Managing your economy is more fun and interesting now. The ability to import resources is a big plus. The Shopping Mall allows you to sell luxury goods to your citizens which will raise there happiness. The Stock Exchange adds a dash of capitalism and private enterprise to the system. This truly allows you to build completely capitalist Tropico if you like. This of course effects your faction ratings with communists and capitalists. The mission system makes it a lot easier to figure out what your people really need. Your cabinet adds a little more personality to your administration. The diplomatic missions you get from certain countries can really let you tilt the scales towards the communist or the capitalist. The dynamics of the cold war are more relevant. If your a fan of Tropico the game is a must. Is it worth the $39.99 to buy what seems like an expansion? It really depends on what you look for in a game. This is exactly what we hoping for in the next iteration of Tropico. Of course we always want more and it seems like they could have given more bang for the buck. If it goes on sale, we certainly would recommend it. If your a fan of the series, then buy it now.